It's hard to believe that we are already into June! Where has the time gone? Well, after a season of unprecedented travel and some health issues, here we are! We are grateful now to be able to give you an update on what we have been doing these last 5 months! I am very proud of my husband, Bill, for his accomplishment of losing over 50 pounds to date, as it isn't as easy to lose weight with a slow metabolism!. He is enjoying starting to get a new wardrobe and a better feeling of well-being! I (Teri) had surgery for a retinal detachment on April 11th. They say the recovery period is about 8 weeks or more, and presently I am in the 8th week and am enjoying improving sight day by day! There was no special reason for the detachment other than being over 50 (what?!) and having had cataract surgery (which increases the risk of a detachment) two years ago! Part of the recovery required me to lay on my right side for 20 hours out of a 24 hour period of time for two weeks! I listened to a lot of scripture and books as I couldn't read either! Definitely a trying time! But thank God my eyesight is about 90% back to normal! Now for the Ministry Stuff! 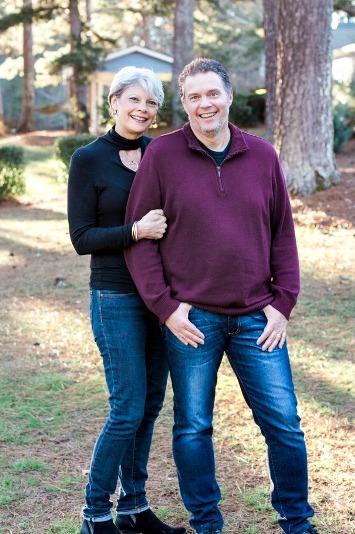 After 25 years of faithful service in OM as International Music Minister, and then founder and Director of OM Arts International, Bill was asked by the International Director of Operation Mobilization to become the Director of Catalytic Ministries. "What exactly is that?" you might ask! Well, firstly Bill has not been asked to stop doing public ministry! He will continue to do concerts, lead worship, evangelize, preach and teach and disciple, and he even gets to continue in his role as Director of Incarnate: OM Arts' school of mission which raises up other younger Artists to become missionaries. Bill is now in a top, Senior leadership position in OM, where he is the supervisor for all those who are running ministries that are seen to be catalytic ministries for "Planting Vibrant Communities of Jesus Followers Among the Least-Reached" (OM's new mission statement and ministry focus). As OM moves more and more toward becoming a church-planting movement, there are a number of key strategic ministries that have been raised up over the years that have a demonstrable impact in evangelism and church planting, especially in nations and people's that tend to be in difficult regions of the world that have been resistant to the gospel. Bill's experience in developing OM Arts was part of the reason why he was chosen for this new role, and as such, he will be overseeing the extremely talented people who run ministries in OM engaging in Arts, Sports, Business 4 Transformation (B4T), Relief & Development, HIV/AIDS, and Justice. One of the things that makes ministries like this so powerful, is that they all are engaging in cultural universals - these ministries touch culture where culture "lives", and as such, speak to a culture in ways that the culture is already speaking to itself. These ministries are "Incarnational", in that by engaging in these arenas of life as Christians with those we wish to bring Jesus to, we humble ourselves, we arebirthed into other cultures, we embody Christ in our life and work, and we "dwell with" those to whom we bring the love of Christ. These four ingredients encapsulate what it means to be Incarnational, as Jesus exemplified for us in Phil. 2 and John 1:14, and we are never more Christ-like than when we are incarnational in the way we approach those we want to reach with the gospel. The result is that Bill has embarked on probably more travel than he ever has before in his life! Just this year alone, he has been to Thailand, Turkey, Germany, and Sweden, and before the year is out will be in Hungary, Austria, Canada, South Africa, Zambia, and Moldova, the poorest country in Europe. These Catalytic ministries are meeting people on the raw cutting edge of life, and are bringing the truth and hope of Jesus right where they live, breathe and work. It is an incredible privilege to be used in this way, and we look forward to how God is going to use us further in the coming days. See below for two stories that come from two of these Catalytic Ministries, and how people were brought to Christ, and lives were totally changed! I have been working with our team regarding curiculum, spiritual formation etc. for our upcoming Incarnate school starting late January 2018! We aim to make this the best one yet. Of course learning from the past year's experience always helps. I also am available to Bill for some administrative tasks. I also have 2 young women I mentor regularly and often Bill and I find ourselves counseling with young marrieds and singles as well. Being available to server in various roles as the Lord leads seems to be the season I am in at the moment. We met Nabin* and Suraj* in 2012 through the fact that the OM Nepal guys team used to buy their coffee there. An investor trip was planned for that August,and in June we had already started putting a business plan together. The brothers had many ideas, but we felt that the most critical and 'catalytic' would be for them to acquire a larger coffee roaster. At the time they were roasting coffee in an old popcorn roaster…roasting 1 kg every hour. We submitted their business proposal and they were able to secure a loan of USD22,000. They sourced a roaster in India, and Nabin went for training, and this roaster was able to roast 20kg in 20 minutes. 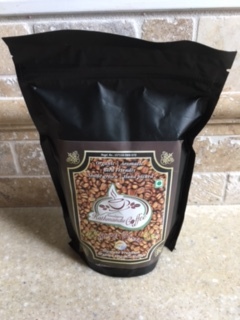 A 60 fold increase… This led to an increase in production of roasted coffee beans, more employment opportunities in Kathmandu and rural communities, outreach into communities, strengthening relationships, more finances released into ministries that they support… etc.etc. By B4T partnering with ONE businessman, we are growing and strengthening the Kingdom of God in a very real and tangible way, in tens, if not hundreds of communities in the Himalayan region… Jesus is demonstrated in word and deed, and people lives are being totally transformed. PS. Spin-offs of High Mountain Coffee has been the opening of Kathmandu Café, Grace Café, and soon to be opening a third café. This has led to twenty or more people being trained as baristas, and others in the catering business – a key issue in Nepal, a country that loses many, many people to overseas work, pulls families apart and breaks down the social fabric of the society… and all hear the Gospel! "How could God ever use this?" This artist, in a Muslim country with a team of visual artists for a short term mission trip, had struggled to render the concept that OM Arts had asked the team to paint: I am the door, those beautiful words of Jesus that invite us to enter the Kingdom of Heaven. 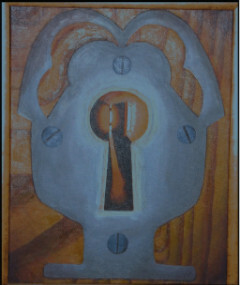 But she had painted a lock—a heavy, massive medieval kind that looked impenetrable and imposing. Through the keyhole another door was visible, slightly open with light emanating from it. How could this communicate? How could God take that which she had painted and use it for His glory? The old man strolled slowly through the open-air art gallery that had suddenly appeared in the plaza. He surveyed the beautiful pictures of doors and gates. There was one that captured his attention; it was of a lock. He stood stunned, as the revelation hit him. Someone had painted his life, his longing, his desperate condition of being locked out from the light. Light that he just knew was there for him, but had been so elusive in his own religious tradition. He knew in the moment he saw the painting that the artist who painted it had the insight and wisdom he had been seeking his entire life. The young artist approached the old man with a translator, and asked him why he was staring spellbound at her painting. Through tears, the man said to her, "My entire life I have felt locked out from all God had for me. I can see it through the keyhole, but I can't get to it. Can you please tell me, what is the key that will unlock the door of my life, and let me run into the light of God?" right there in the plaza. The Holy Spirit had used her painting to unravel this man's heart, and draw him to the Father heart of God. Our next ministry trip takes us on our annual Bill Drake Band tour in Hungary! We are privileged to be doing this trip with our daughter, Sharayah, and our Hungarian son-in-law, Bence. That's where it all started for them anyway back in 2010! We will be doing 10 evangelistic concerts in 14 days. Some of the venues are outdoor in a town square, another includes a drug rehab center and then crossing the border into Vienna. All concerts are done in partnership with local churches and OM Hungary. A few weeks after we return, Bill will be going to Canada to lead worship for a missions conference and then to Zambia and South Africa for a variety of different kinds of strategic ministry from teaching, evangelizing, helping with church planting, and mobilizing Africans in to mission. Thank you for your interest, prayer and support for us! We appreciate having you all our our prayer and financial support team! 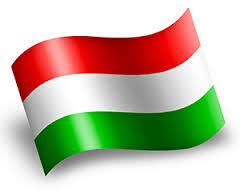 Safety and favor in Hungary - we will be doing a lot of driving and with all the terrorist attacks going on pray for none to come near us. Safety and favor for Bill while traveling to Canada, S. Africa and Zambia. Wisdom for Bill as he takes on this new Senior leadership position in OM. Bill leads the Catalytic Ministries Division of OM International, and as such plays a very strategic role in seeing vibrant communities of Jesus followers are planted amongst the least reached peoples of the world. Copyright © 2017 Operation Mobilization, All rights reserved.